Michael Green and Jill Feldman attended the first two editions of the FIE Coaching Academy in Budapest Hungary in 2017 and 2018. Green and Feldman talk about their experiences at the Academy, what motivated them to apply for the program and their takeaways. Amanda Stanec, Ph.D. and I talk about physical literacy – the confidence and competence to be physically active in a wide variety of environments (land, snow, ice and water) to benefit yourself and your community. Physical involves more than fundamental movement patterns and encompasses personal and social responsibility. Amanda majored in physical education, played soccer and later taught PE and coached soccer. She worked to support PE curriculum in Canada and was part of approving the Canadian definition of physical literacy. Her company MoveLiveLearn seeks to bring together sports, health and PE experts. The owner of Gryphon Fencing Club, Eric Holmberg's club offers both fencing and archery. Eric started fencing in college at UC Irvine, where he is currently the head coach. The club started in the local church and now is in their current location in Placentia, CA. Eric talks about his own discovery of archery, how he thinks it complements fencing and shares some common ground in folklore. He also discusses how movies like “The Hunger Games” and “Brave” led to a surge in interest in archery, especially among girls. As a club owner, Eric added archery to provide another revenue stream and an activity for the siblings of fencers who might not want to fence. He also talks about how some students have come in for one sport and tried the other. Sometimes the student ends up choosing the “other” sport. Eric also shares some of the ways he is getting fencing out of the club, whether it is setting up in local parks or at a pub. 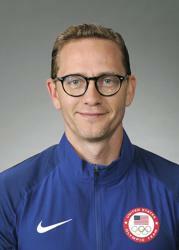 A former elite fencer, Jeremy Summers went on to become a chiropractor who joined the USA Fencing staff as the director of sports medicine in 2015. Jeremy works with National Team members to provide health care services and consultations. He also coordinates the medical staff at all USA Fencing national events. We discuss his background as a fencer, including being an alternate to the 2000 U.S. Olympic Team and how an injury he suffered got him on the path to sports medicine. We discuss the acute and chronic injuries common in fencing along with tips for reducing the risk of suffering such injuries. The good news is that fencing is a relatively low injury sport. A key takeaway is to have a good strength and conditioning program and also to maintain mobility as we age. Jeremy also discusses finding a good sports medicine practitioner to treat your fencers (or yourself). Tip: look for a sports medicine specialization in a healthcare provider. Jeremy talks about the scope of practice of athletic trainers, chiropractors and medical doctors. We wrap up with some discussion on treating injuries like sprains and Jeremy gives several take home messages that you can start to use immediately. her and reflects a bit on how fencing has changed in the past 30 years. She also shares her remembrances from the 2000 Olympics both the good and the not so good. Rio Olympian Kat Holmes is the guest on this podcast. Growing up in Washington, D.C., Kat played a lot of sports like swimming, tennis, basketball and soccer. An avid reader of medieval books, Kat learned to fence through a parks and recreation program and fencing captivated her like no other sport. We talk about her current work with neuroscience, especially concussions. Kat shares how her family supported her. We talk about her coaches developed her and kept the passion for the sport going. She discusses how coaches worked with her attributes rather than forcing a style on her. She discusses how she accepts being coached with specifics during a one-minute break in a bout. We discuss the importance of good communication between coach and athlete. We also discuss balancing academics with pursuing the Olympics. Lesson for parents: never say never! 2016 Paralympian Lauryn DeLuca joins us on the podcast to discuss how she was recruited for wheelchair fencing and her adjustment to able-bodied to wheelchair fencing. Lauryn shares how she likes to be coached (straight up and honest) and why she chose fencing as an individual sport over team sports like baseball and soccer. We discuss how the wheelchair classification system works as well as how Lauryn qualified for the Paralympic Games while she was just a sophomore in high school. One of the youngest competitors in Rio, Lauryn talks about her Paralympic experience, both in and out of competition. 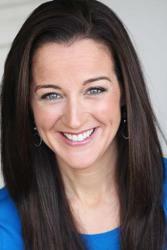 Jennifer Turnnidge is a doctoral student at Queens University in Ontario, Canada. Her work focuses on the concept of transformational coaching. This is an approach to coaching that looks to develop the whole athlete and not just in the technical and tactical domains. Many coaches exhibit transformational coaching behaviors without realizing those behaviors have a name or fit into a model of leadership. Transformational coaching has the 4 I’s: Idealized Influence, Intellectual Stimulation, Inspirational Motivation, and Individual Consideration. We discuss some traits of the transformational coach that include asking questions and partnering with the athlete to discover solutions rather than the coach bestowing the answer upon the student. Maureen Griffin is a fencing coach and has been the owner of the Golden Gate Fencing Club (GGFC) in San Francisco for 20 years. In this episode, we discuss a bit of Maureen’s background as a fencer and how she got into coaching. We also discuss the club culture at GGFC with its motto of “build the person, build the athlete, build the champion.” Her approach to coaching is a partnership and follows some of the tenets of transformational coaching. Maureen has seen that kids coming to the fencing club these days lack simple physical movement patterns (physical literacy) compared to kids years ago. She also shares her thoughts on finding a coach, being genuine as a coach and club owner, and the transition to college (from a coach perspective). Taylor Hynes is a graduate assistant strength and conditioning coach at Northwestern University in Evanston, IL. She is pursuing a master’s degree in sport administration. One of the teams she works with is the fencing team. Taylor has a varied athletic history as a high level swimmer, track and field athlete and now a competitive weightlifter in Olympic-style lifting. 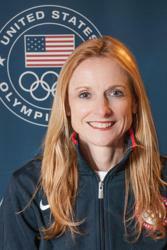 She ran for Depaul University in Chicago and earned degrees in sport physiology and sport psychology. 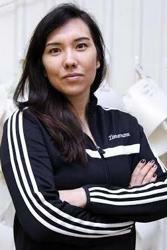 Our discussion includes her observations on what fencers can do to prepare for high level competition from a conditioning and movement perspective. We discuss the assessments she does with the fencers and some of the conditioning she puts Northwestern fencers through including strength training, aerobic and anaerobic conditioning. We discuss her role in working with the athletes as a strength and conditioning coach. She places a strong emphasis on mobility, stability and coordination. Here is the link to the video Taylor referenced in the interview. During this interview, Coach Moss and Coach Momberg give their backgrounds in fencing plus offer their insights into collegiate fencing specifically at Northwestern. NCAA recruiting rules: when can coaches initiate contact with prospective student-athletes? Specific dates are included in some cases. Grant-in-aid issues. The NCAA limits a women’s only program (which Northwestern is) to five grants-in-aid and the team has 30 women…Yes, the grants are divvied up. The transition to a college TEAM. Emphasis on TEAM. The support staff available to help the student-athlete such as strength and conditioning, academic advising, athletic trainer, etc. This episode features USA Women’s Foil National Team and University of Notre Dame coach Buckie Leach. With 38 years of coaching experience, Buckie has learned a lot and keeps learning. We discuss his role as national team coach such as coaching the team event at competitions and developing rapport with referees and how that can help the athletes. We also discuss collegiate fencing and the challenges a fencer might face. He shares some of the resources that Notre Dame offers to assist fencers in getting better but also to help them succeed as students. One of the things I really like about Buckie is that he is still wanting to learn and improve as a coach. Buckie also shares how he has changed as a coach over the years. Dr. Anders Ericsson is the author of Peak: Secrets from the New Science of Expertise and a professor at Florida State University. Dr. Ericsson has spent his professional life studying how experts become experts. What techniques do they use to get better? How do those differ from what non-experts do? A key outcome is the concept of deliberate practice. When most people go to practice whatever it is that they want to get good at, they will usually do the same thing over and over without a clear purpose or focus. They often lack a way to gain feedback either from a coach or using video. Often the practice does not provide a challenge above the current level of expertise. approach work or not work? Dr. Ericsson can be reached at ericsson@psy.fsu.edu. In today’s podcast, I discuss sport psychology and mental skills training with Dr. Karen Cogan from the United States Olympic Committee (USOC). 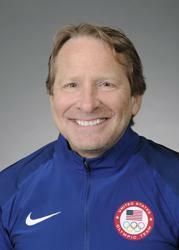 Dr. Cogan works with many of the Olympic combat sports (wrestling, judo, etc.) including fencing. She sometimes travels with the National Team to international competition as well as working with them individually. During the podcast, we discuss her background as an athlete and injuries influenced her career path. We discuss the differences in sport psychologist consultants and those with a clinical background. There is a bit of caveat emptor when it comes to this world, but the Association for Applied Sport Psychology would be a good place to start. Dr. Cogan discusses how a sport psychologist might work with athletes and coaches on mental skills training, managing competition anxiety and other areas. She gives a good overview of some areas that anyone of any age can work on when it comes to mental skills. Obviously, these need to be adjusted for the age and maturity of the athlete. These skills are like other skills and need to be trained regularly. There are no magic pills or words or shortcuts, but a sport psychologist can help an athlete navigate the mental skills world and perhaps speed up the learning curve. Also, we poke a little fun at one of her colleagues whom I have known for a while. 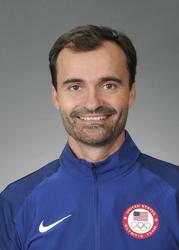 Sebastien Dos Santos is the USA Fencing Director of Epee and took some time to discuss his role. Dos Santos is a proponent of using mental skills training and sport psychology to improve performance. During the interview he shares his thoughts on mental skills training and being in the moment during competition. He notes that these skills need to be practiced during training in order to be used during a competition.